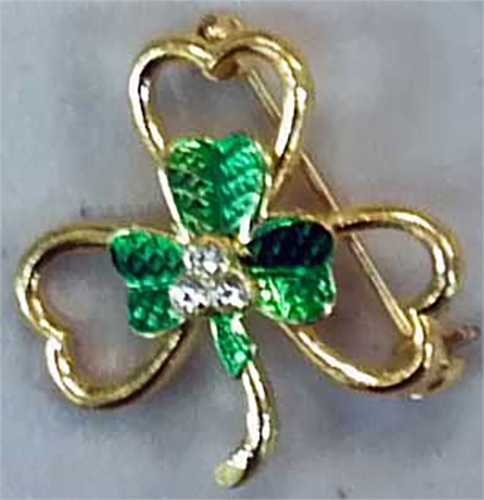 This Irish costume jewelry pin features a triple shamrock design. This Irish costume jewelry pin features a design that consists of a crystal shamrock on top of a green enameled metal shamrock on top of a gold tone metal shamrock! This costume jewelry shamrock pin is enhanced with crystals along with green enamel accenting and measures 1 1/8” wide x 1 1/8" tall. The Irish shamrock pin is made of gold tone metal in the Czech Republic. This Irish costume jewelry is received with a shamrock history card, complements of The Irish Gift House.